Tonya Wolford is the Chief of District Evaluation, Research and Accountability. In this role, Tonya oversees the District Performance Office, the Office of Research and Evaluation, and the Planning and Evidence-based Supports Office. The Chief of District Evaluation, Research and Accountability leads the District’s use of data and evidence to improve outcomes for students. This is achieved through the annual School Progress Report; Qlik-BAM, a suite of interactive dashboards; ongoing program evaluations and research; the comprehensive planning process; and professional development and technical assistance offered to leadership, Assistant Superintendents and Principals. Prior to assuming her current role, Tonya worked in research and evaluation at the District for eight years, starting as a Senior Research Associate and moving up to Deputy, Research, Evaluation and Academic Partnerships. Prior to joining the District, Tonya was an Assistant Professor at the University of North Carolina, where she taught courses in Spanish and English language, linguistics and translation. She previously worked in Philadelphia at the University of Pennsylvania conducting research on the effect of non-standard English dialects on reading in elementary school. Tonya began her career in journalism and then medical education, spending many years working on k-12 medical education pipeline programs for underrepresented minorities. Tonya is a graduate of the University of Maryland where she earned a B.S. in Journalism; and the University of Houston, where she earned a Master’s in Second Language Education and a Doctorate in Spanish Linguistics. Tonya is vice-chair of the governing board for the Regional Educational Laboratory Mid-Atlantic (RELMA). 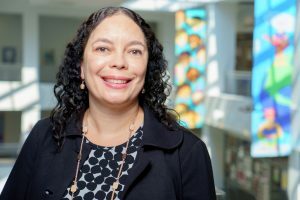 She also serves on the steering committee for the National Network of Education Research-Practice Partnerships at the Kinder Institute for Urban Research, Rice University.